No input power 1. Input switch is turn on or not? 2. Input voltage is right or not? 3. The fuse is burn down or not? 1. Turn the power supply input switch. 2. Connect to correct voltage power supply. 3. Check the fuse and replace the fuse with same specification if necessary. Output power outage 1. Is it power off or momentary power off? 2. Make sure the loads are within the frequency converter's capacity. No output voltage 1. Is the fuse burn down or not? 2. Is it overloaded? 1. Check the fuse and replace the fuse with same specification if necessary. Voltmeter, ammeter and power show "0" when the output frequency is normal. 1. Turn the power switch to "OFF" position. 2. Change output voltage switch to zero. 3. Turn the power switch to "ON" position. 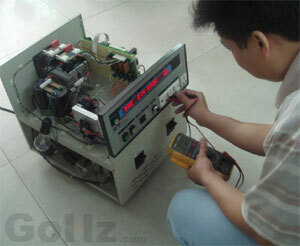 Voltmeter, ammeter and power show "0" and alarm rings when the output frequency is normal. 1. Check and decrease the loads' current. High temperature 1. Is it overload? 2. Cooling fan speed is slowdown or not to work 1. Decrease loads. 2. Replace a new cooling fan. 1. Frequency converter model & serial number. 2. Date & Time of the failure. 4. Detailed description of the failure. Wipe the cabinet, cover and venting holes with a soft cloth and detergent. Visual inspection of all power lines and terminals, see if there is collision, loose, hot corrosion, moisture, insect bites or rat bites, do some repairs or replaces if necessary. Note: DO NOT do any maintenance if you are not a qualified electrician, and make sure the frequency converter is discharged completely before proceeding any maintenance.